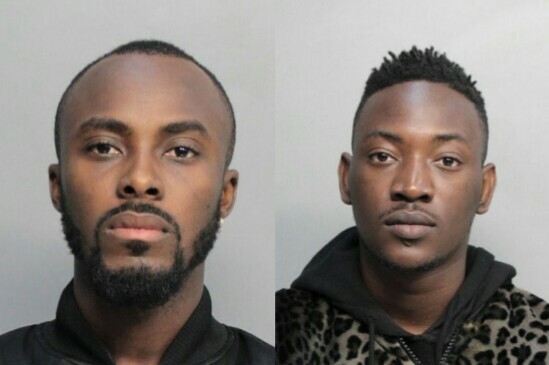 A copy of the Complaint/Arrest Affidavit for Nigerian pop singer Dammy Krane and his co-defendant Chukwuebuka Gabriel Ilonchowu (“Ebuka”), an alleged U.S. promoter who allegedly hired Krane’s services to perform in the United States have been obtained by AML. The complaint explains the details of how and why the two were arrested for the alleged crimes of grand theft, credit card, and identity fraud, among other charges. To summarize the allegations against the two, Krane and Ebuka purchased two private charter flight tickets with fraudulent credit cards to travel from Miami to Washington D.C. The CEO of the company they purchased the tickets from, Eugene Kesselman of Tap Jets Inc., was suspicious of them and contacted the police who arrived and waited for them at the airport. When the duo subsequently arrived at the airport, the police detained them and subsequently took them into custody, after an investigation. The police say they were able to identify the duo by their legal names. Dammy Krane had his passport along with several credit cards in the front of his pant pocket. Three of the credit cards were in Krane’s name but four were in the name of a William Payton III. The duo each had a book bag and a suitcase. When the officer searched those, legitimately per the officer’s claim, they found several cell phones and laptops in the bags of the duo. By the way, the police say in the complaint that Kesselman’s employee Stephanie Rodriguez claims that she received a call from Dammy Krane who wanted to know when his jet flight would arrive, and also whether there were issues with the credit card on file for him. The police claim that even though she knew that there was an issue, she did not want to alarm him. So she told him there was no issue. Nevertheless, he mentioned there were other card numbers he could give her to ensure there was no issue. As it stands, both co-defendants are still in custody and have been denied bail. Dammy Krane who was set for a Nebbia Hearing on June 6, appeared in court and was denied a release on bail. He is set to be arraigned on June 23rd, 2017. Read the complaint/arrest affidavit here.